We drive the every-winding island roads, high on good coffee and great conversation. We share. We dream. We plan. I love my man. We see the world in similar ways, and when we get talking, our passions align and LOOK OUT!! I am better because of him. He completes me, and all that jazz. I know. Enough gooey mushy stuff. This weekend took a sudden change of directions when my long-weekend was suddenly shortened to two days off – no Strathcona backpacking adventure for us this time. What’s a pair of summer-chasing, nature-loving souls gonna do? 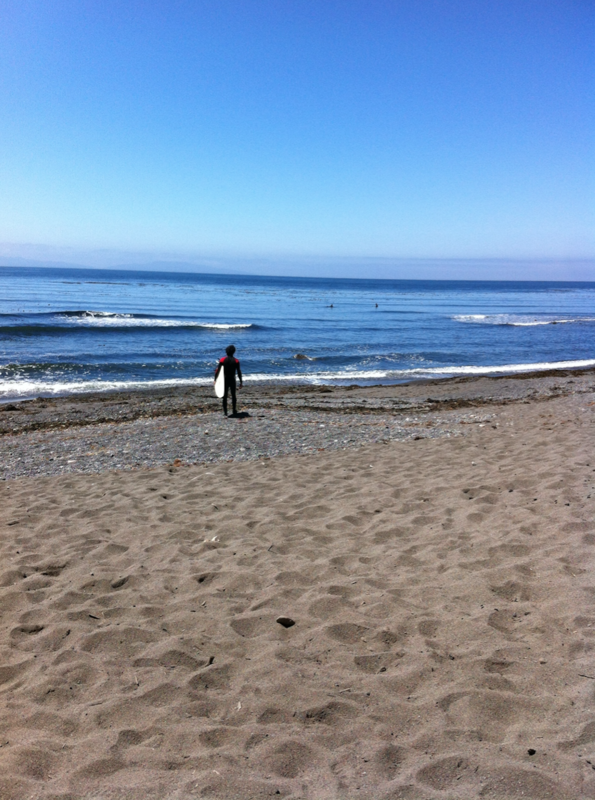 Surfing at Sombrio beach was a likely and fitting idea. 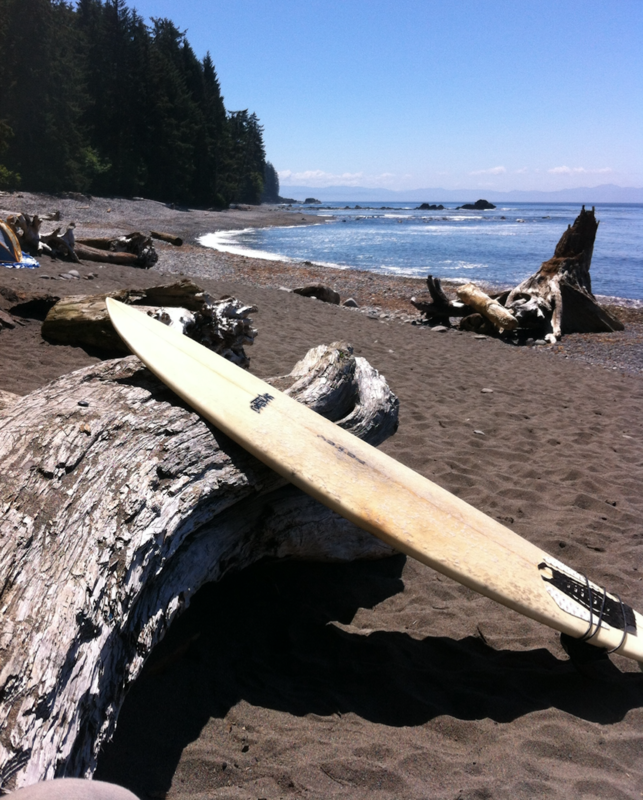 Pack-up Hobo (to the gills – good thing we share a surf board! ), and hit the road! Back to the perpetually winding roads. I was CAR SICK – like, green-in-the-face, over-abundance-of-saliva, going-to-vomit-any-second kind of car sick. Yuck. I’m thinking delicious americano on an empty tummy does not fare well with island roads…? We pull into the parking lot, littered with vehicle after vehicle, and head to the water. 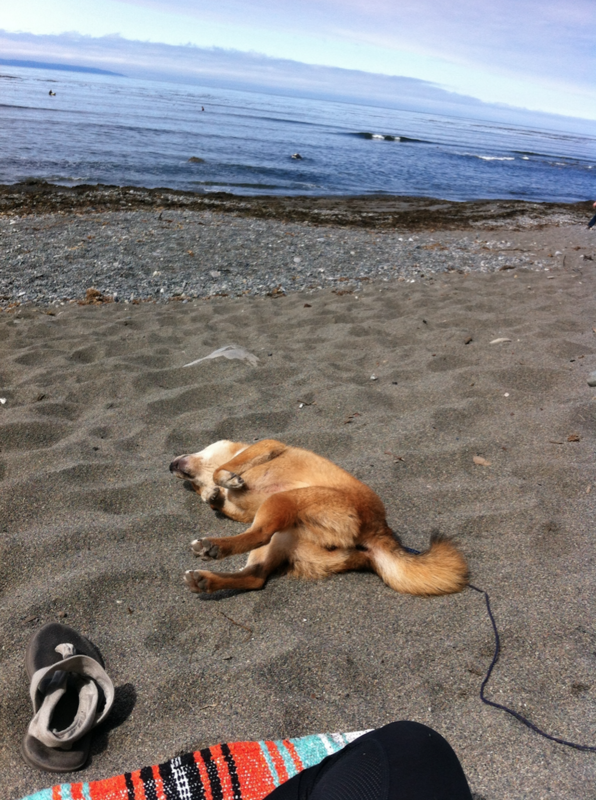 Sitka and I chill on the beach (both recovering from the drive – Sitka gets “green” too), and Dan jumps into his “wetty.” The point break is spotty, and the waves are so-so, but Dan manages to catch some surf. 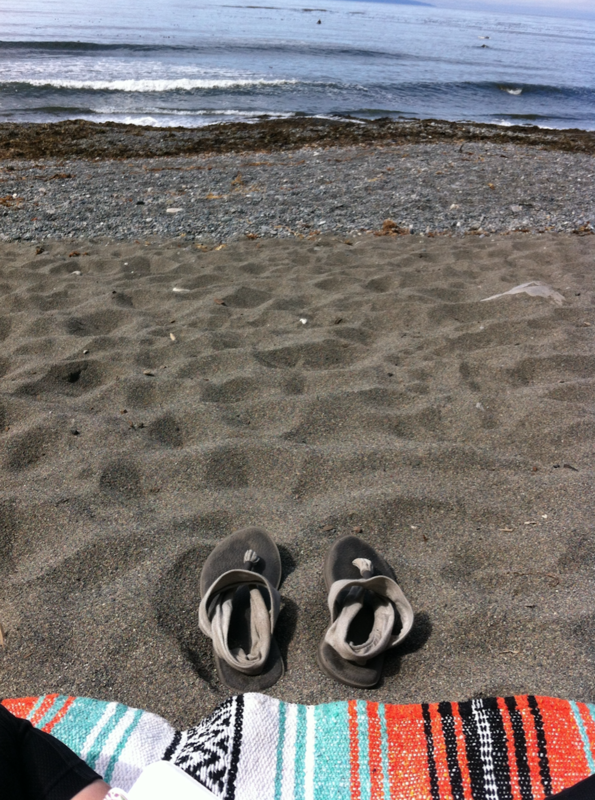 We opt out of camping at Sombrio, preferring to get away from the hoards of people. 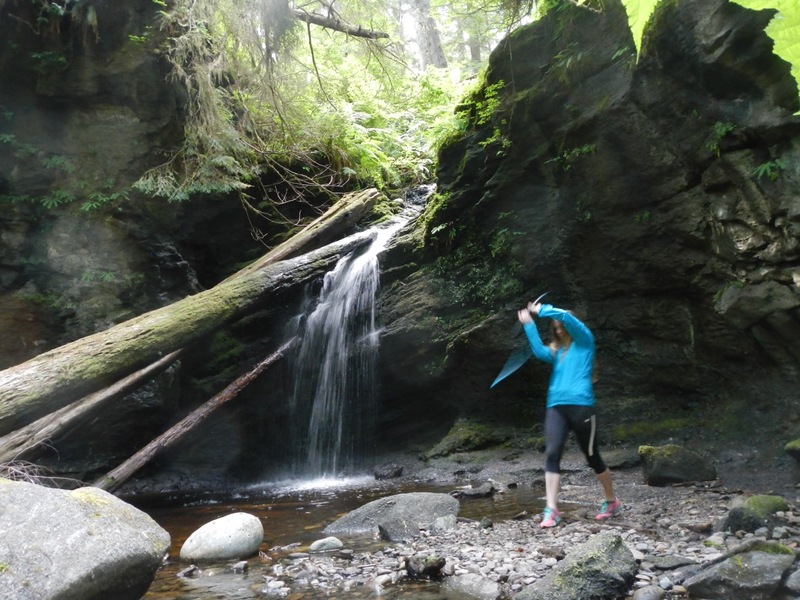 We drive up the road another 10 kms to Parkinson’s Creek, and hike 3 kms towards the ocean and intercept a campsite along the Juan De Fuca trail. 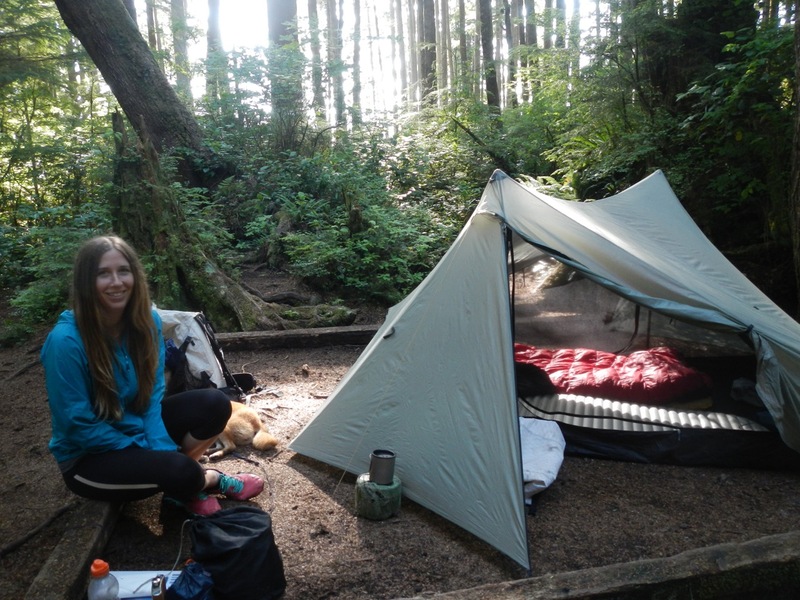 This is more our style – alone, quiet, and surrounded by (partly) old-growth trees. We set-up camp. 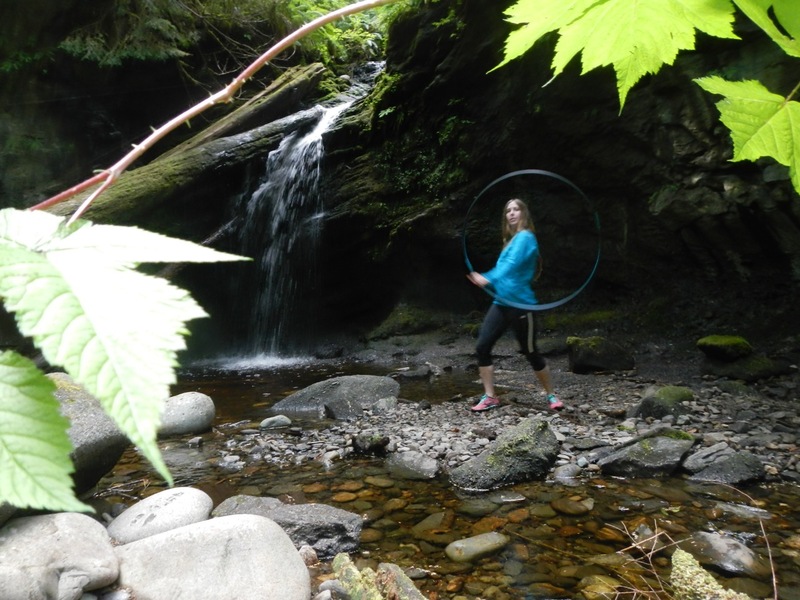 I whip out my hula hoop, which Dan enthusiastically grabs and graces me with his mad hooping skills; honestly, that guy is good! (Sorry I didn’t snap a picture or two). We head back to Sombrio the next day, and the waves are better. I stay on the land again, as I continue to feel queazy and unwell. I meet Tyler – a fellow Victorian, who is currently a wave-chaser, and also a previous backcountry pow dabbler. We hit it off; would you expect any less? When Dan comes in from his session, the three of us converse about the work-play balance, and how to strike a balance that heavily favours “play.” Is that even a balance anyway…? Whatever. I know this type of existence isn’t for everyone, but it’s always fun when we meet other people who are interested in creating a similar playful life. Tyler used to wake up at 6am, catch waves on Sombrio Beach, then head to Victoria for a full work day. That’s commitment! And that’s balance. Work and play. Sure, it would be great to just be a surf bum all the time, who never has to say “no” to a good set. But is that practical? Is that sustainable? Probably not. So my hat’s off to you, Tyler, for making the sacrifices you needed to make in order to strike the balance. Thanks for the inspiration and the reminder that we can (oftentimes) create the life we want. What do you wish you had more of in your life? What could you do to squeeze it in? What would you need to give up?